The perfect way to display our hanging ornaments, our scroll hook sits securely on a shelf or mantel. It's also great doing double duty as a stocking holder during the holiday season. Personalized with the letter of your 1.5'' gold letter of your choice. CUSTOMIZE WITH YOUR INITIAL! 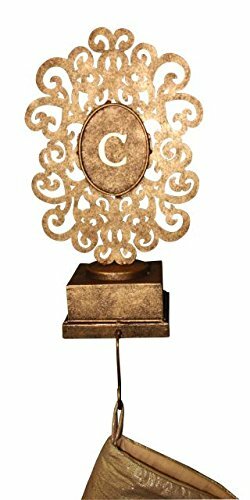 Personalized with 1.5'' antique gold monogram letter of your choice - please specify. Handcrafted of iron and tole. Hooks on the back for hanging. Use with our hanging ornaments or as a stocking holder.